#cby – Brokerage sales for Cork harbour yacht broker Crosshaven Boatyard (CBY) in 2013 was steady with some boats going abroad but thankfully the majority staying in Ireland. Recent boat sales for CBY include a 2006 Jeanneau Merry Fisher 925, 1998 Jeanneau Sun Odyssey 34.2, 1983 Beneteau First 30e and a 1984 Gib'Sea 76. 'Enquiry levels have been promising in the last few weeks' says CBY's Hugh Mockler who is looking forward to increasing sales in 2014. 'We are in a fortunate situation in that as soon as we sell a few boats on brokerage new additions appear i.e. 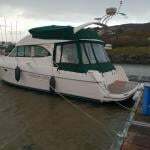 we have just added an excellent 2005 Jeanneau Sun Odyssey 49 DS to our brokerage and we also have a 1975 Dufour 35 and a 1979 Rival 38 coming shortly,' he adds. CBY is actively promoting new yacht sales too. The brand new Dufour 310 Grand Large which was launched at Paris Boat Show and the new Dufour 560 Grand Large to be launched in Istanbul next Month are also on their books. 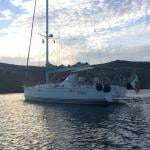 #BOATS FOR SALE – A 'lightly used' Dufour 385 built in 2006 has been further reduced by €15,500 and is now available at €99,000. The family cruiser is described online as 'solid and well equipped'. The yacht, which can be seen at Crosshaven boatyard, Cork comes with an upgraded engine (40HP Volvo). The yacht has twin wheels and an In-mast furling mainsail. The full advert giving detailed specs is on the Afloat Boats for Sale site. An easily handled sailing cruiser that is ideal for both family cruising and club racing, that's the verdict on this 2001 Dufour 32 Classic for sale through broker Crosshaven Boatyard with an asking price of EUR54,950. 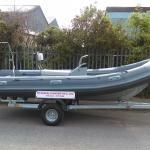 Its just been added to Afloat's Boats for Sale site. All the details including broker video, photo, specs and summary here. Crosshaven Boatyard Company Ltd has announced that Hugh Mockler, (formerly of HM Yachts Ltd), is to join long established yacht broker, Donal McClement in the Boatyard's new boat and brokerage sales division. 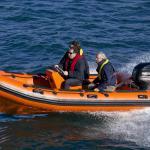 Crosshaven Boatyard has been providing marine services for over 60 years. The boatyard also specialises in all aspects of the repair and maintenance of modern pleasure boats. Many well-known boats such as Gypsy Moth V, the Saint Brendan, Longbow II and a series of Moondusters were completed in the1980s. It was the first commercial marina, with a marine travel hoist, in Ireland in 1979. The yard is the Irish distributor for Dufour Yachts of France, and Grand Soleil, of Italy.